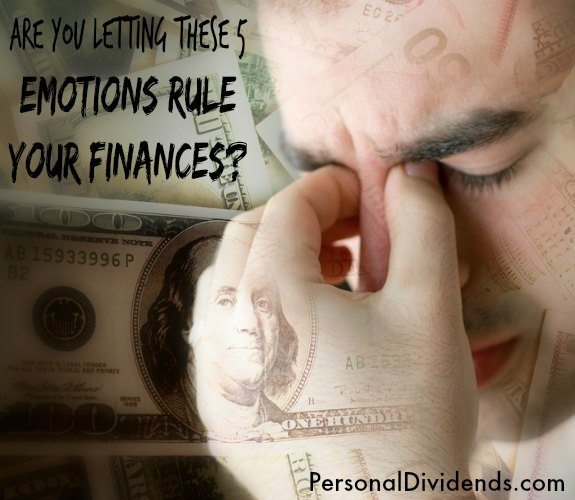 Are You Letting These 5 Emotions Rule Your Finances? One of the biggest problems that many of us have when it comes to money is that we often let our emotions get the best of us. Strong emotions cloud our judgement and lead to poor decisions that, too often, we regret later. There are two facets to fear. First of all, is the fear of loss. Many of us don’t invest in a way that allows for gains over time because we are so afraid of loss. This fear can mean that you keep your money in “safe” investments that result in low returns that will never help you build wealth effectively over time. But there is another type of fear that can cause problems: The fear of abundance. “We may fail to negotiate a higher salary because we fear we can’t live up to it,” says Toneatto. Plus, there are those who have no idea what they’d do with success, and fear that success more than anything else. This type of fear can hold you back, and keep you from pursuing success. One of the biggest issues that can hold you back is guilt over spending. Of course, you don’t want to spend too much. However, you can’t let guilt over spending any money keep you from enjoying life. Toneatto points out that it’s not healthy to have a guilty feeling with money. She also warns against letting feelings of guilt lead you into making poor decisions, like giving away more money that you can afford, or lending to unreliable friends and family. Shame can prompt you to avoid fixing a problem that needs to be addressed, or you wish to appear successful can lead you to spend just because you think you “should” in order to be like everyone else. One of the problems with anger, according to Toneatto, is that it prevents you from making connections with others. This can prevent you from taking advantage of good opportunities, and being someone that others want to partner with. Additionally, anger can cloud your judgement and lead you to make rash decisions that can ruin your financial prospects for the long-term. The biggest problem with blame is that it can prompt you to avoid taking responsibility for your actions with money. While it’s true that unexpected circumstances outside your control can result in financial problems, holding on to that feeling of being wronged can slow your recovery. While you might not have been able to control some of your financial circumstances, you can control how you react, and the steps you take to get out of trouble. The sooner you do your best to get control of the situation, the more likely you are to have success later. “Blame can sabotage relationships with both people and money for years,” Toneatto points out. These emotions can get in the way of your financial success if you aren’t careful. Make it a point to recognize when you feel these emotions, and then take steps to overcome the emotions and move forward with your life, and with your money. You’ll be happier — and more successful.